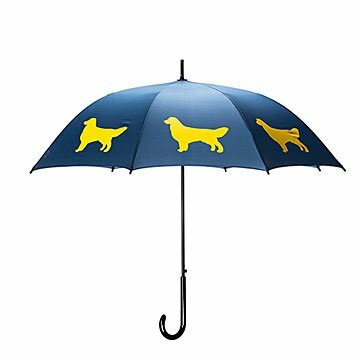 This umbrella for dog lovers features silhouettes of your favorite breed parading around its edge. The perfect breed of umbrella for dog lovers, this rainy day accessory is strong, reliable, and always ready for a walk, whatever the weather. With silhouettes of your preferred pet circling the perimeter, it's sure to receive two paws up at doggy daycare, the park, and anywhere else you show puppy pride (i.e. everywhere). Made in China. When Marc Brown and his wife moved to San Francisco, their first winter in the city was a real Bay Area season: all fog, rain, and wind. As Marc walked the streets, elegant ladies and determined businesswomen would suddenly appear out of the fog, but all he could see were ugly umbrellas with broken ribs, failing to keep the rain off their owners. There had to be something better, he thought—and when he started his own umbrella company, there was. Click here to see all available Dog Breeds. She uses it when she takes her dogs for a walk. Makes a great golf umbrella. Great quality umbrella. And shouts your puppy love. Great Secret Santa Gift for the Hard-To-Buy-For. For the 2018 family Secret Santa, I drew the most difficult family member to buy for. Her recent CKC Spaniel rescue made this (along with similar themed socks and key chain) a perfect gift. Pug umbrella was a perfect gift. Very well made. Great colors-- they make the umbrella just pop! This umbrella is a good weight and a large size to make it perfect for rainy strolls to keep you nice and dry. Plus the cute dogs on the umbrella make any rainy day a happy day!